Rare first edition on the most important voyage of the North Pacific! In 1791, Royal Navy officer George Vancouver set out on an expedition to North America’s Pacific Northwest, exploring western Canada, Alaska, and parts of Northwest United States. 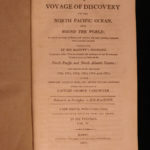 The specifics of this voyage were published in 1801 by Stockdale, in an impressive six-volume set, which is often considered to be the most accurate account of the Pacific Northwest. According to Howes, of all modern expeditions to the Pacific, Vancouver’s is one of the most important. In this work Vancouver also describes Alaskan and Canadian natives, nautical and astronomical wonders, and encounters with Spanish missions. A voyage of discovery to the North Pacific Ocean, and round the world : in which the coast of North-west America has been carefully examined and accurately surveyed. Undertaken by His Majesty’s command, principally with a view to ascertain the existence of any navigable communication between the North Pacific and North Atlantic Oceans ; and performed in the years 1790, 1791, 1792, 1793, 1794 and 1795, in the Discovery, sloop of war, and armed tender, Chatham, under the command of Captain George Vancouver. London : Printed for John Stockdale, 1801. First edition.